So different from the Eternal Sky trilogy! That one was epic fantasy, with broad scope and about a million pov characters. I enjoyed it and admired it, but I liked Karen Memory quite a bit better, mostly because it’s got just the one protagonist and I loved her voice. Yes, that is an octopus behind the protagonist. You ain’t gonna like what I have to tell you, but I’m gonna tell you anyway. See, My name is Karen Memery, like “memory” only spelt with an e, and I’m one of the girls what works in the Hôtel Mon Cherie on Amity Street. “Hôtel” has a little hat over the o like that. It’s French, so Beatrice tells me. Some call it the Cherry Hotel. But most just say it’s Madame Damnable’s Sewing Circle and have done. So I guess that makes me a seamstress, just like Beatrice and Miss Francina and Pollywog and Effie and all the other girls. I play my sewing machine tax to the city, which is fifty dollar a week, and they don’t care if your sewing machine’s got a foot treadle, if you take my meaning. Which ain’t to say we ain’t got a sewing machine. We’ve got two, and old-style one with a black cast-iron body and a shiny chrome wheel, and one of the new steel-geared brass ones that run on water pressure, such that you stand inside of and move with your whole body, and it does the cutting and stitching and steam pressing, too. Them two machines sit out in a corner of the parlor as a kind of a joke. I can use the old-fashioned one – I learned to sew, I mean really sew – pretty good after Mama died – and Miss Francina is teaching me to use the new one to do fancy work, though it kind of scares me. And it fits her, so it’s big as your grandpa’s trousers on me. But the thing is, nobody in Rapid City sells the kind of dresses we parlor girls need, so it’s make our own patterned after fashion dolls from Paris and London and New York or it’s pay a ladies’ tailor two-thirds your wage for something you don’t like as well. But as you can imagine, a house full of ladies like this goes through a lot of frocks and a lot of mending. So it pays to know how to sew both ways, so to speak. Really pays. Miss Francina and me, we charge less than the ladies’ tailors. And it’s easier to do fittings when you live with the girls. And every penny I makes goes into the knotted sock in my room for when I get too old for sewing. I have a plan, see. 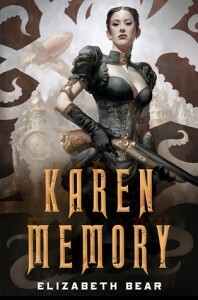 Okay, I know people argue about what is “really” steampunk, and I don’t think I’ve read enough maybe-steampunk to have an opinion about that, but I’d certainly call Karen Memory steampunk. It’s got airships, but it’s also got powered armor – steam powered! – only it doesn’t seem intended to be armor; it’s meant for thing like . . . sewing machines. You fill the machine’s reservoirs with water and kerosene, strap yourself in, and off you go, sewing. You know why you have crazy things like this? Because of genius inventors who pay the mad science tax and then have the right to tinker with crazy machines. The mad science tax is my very favorite detail in this crazy, visually spectacular, comic-book-y world. This book is definitely setting-heavy. Most of the story takes place in Rapid City (took me forever to figure out Rapid City is located where our Seattle is), a city constructed with all these raised sidewalks and things way above the original street level, so you have the new sidewalk level at about the level of third-story windows and when you leave by the front door, you have to climb a ladder to get up to the main streets. The whole city is young and vibrant and still under construction. By construction workers wearing powered armor, of course. So the setting is baroque and delightful. The story is set after what I guess must have been the equivalent of the Civil War, with slaves freed but women not yet able to vote, and a gold rush going on in Alaska. There’s a Wild West feel to the story despite the west coast setting, with a marshal from the west tracking down a killer and other elements you’d typically see in westerns. Plus you get Bear’s attention to detail, which adds depth and a feeling of reality to the setting despite its crazy steampunk elements. The plot is also very comic-book-y, with criminal masterminds and foreign agents and mad science. Add one desperate crisis after another, and villainy and heroism and desperate rescues and daring escapes and all like that. Definitely a roller-coaster ride of a book. Karen Memory . . . I mean Memery, and I’m not sure why Bear chose to fiddle the spelling like that and then title the book as she did . . . anyway, Karen’s much-loved father died when she was a teenager, and that’s why she became a prostitute. Madame Damnable is one of those extra kind and competent madams who runs an enlightened whorehouse where the prostitutes are happy to earn a decent living turning tricks, so that’s pretty much as unbelievable as the steam powered sewing machine. Not that Bear doesn’t pull it off; the trope works perfectly well here; it’s one of the ways she draws a super distinct line between the Good Guys and the Bad Guys, and in this kind of story you want that line to be just as distinct as you can make it, I think. Anyway, Karen is a fine protagonist: engaging voice, courageous, determined. And the supporting characters are good, if drawn in quick, clichéd lines – I don’t mean that as a criticism, and the use of stereotypes – the big, competent, polite marshal who always gets his man, the Comanche sidekick who sneaks around on rooftops and rides so well, the Chinese ninja-type – who is a woman, but still – and so on: all of that is perfect for the dime-novel plot and the over-the-top steampunk setting. One nitpicky detail. No, two. First, you know how in the movie “Titanic” everyone had pretty much the attitudes common to the age, except for the protagonists who had Enlightened Modern Attitudes About Everything, so that the audience would be able to identify with the protagonists in a self-satisfied kind of way. Well, Karen Memory pretty much does that, too. Karen has such modern thoughts about race and sexism and how all people are worthy of respect, it kind of made me roll my eyes. Do you *really* think a whore whose father was no one special would feel offended at being expected to use the servant’s entrance to the mayor’s house? Don’t you think a woman of the time would kind of find that normal, perhaps even appropriate? Wouldn’t tradesmen delivering goods come to a side door of Madame Damnable’s house, at least during working hours? So I thought this kind of thing really did niggle away at the reality of the setting, or perhaps I mean the the veracity of the voice. I thought Bear could have questioned the racism and sexism of the setting more via subtext rather than making her protagonist a bit too good to be true. Second, and this is probably just me, but I hate, hate, hate love at first sight. One glimpse, hardly a word exchanged, and the protagonist has lost her heart permanently. How lucky for her the love object turns out to return her feelings! Isn’t that convenient? It’s not that Bear doesn’t more or less pull this trope off, because she is a really good writer who can make stuff like that work. More or less. But I long for the day the protagonist falls hard at a glance and the love object is just not interested and the protagonist has to deal with her stupid insta-crush not working out. Despite these details, I want to reiterate, this is an entertaining, fun story with an ornate, delightful setting and a compelling narrator. You get good guys you can root for and bad guys you can hate, and the good guys totally win and the bad guys totally lose, and there are a whole bunch of dire, exciting moments on the way to that happy ending. Overall rating, four and a half stars, rounding up to five when I actually go over to Goodreads and Amazon to rate this cause that’s how I roll. Did you notice the hilarious use of tokenism in the story? I loved that it was a gentle mockery of so many things. There was exactly one “straight white guy” good guy…and he was OK because he acted like an Indian Raja, compleat with Indian Raja style airship.